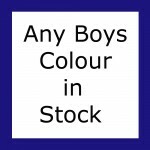 Made from heavy duty pvc in 1 plain colour. These bags are so durable and tough - not to mention the range of fabulous colours! I am extremely happy with them and so are my children. Easy to use website and very fast postage. Thanks Gidgee Smith! !